Slightly related, but something I’ve never really understood with most soldering irons is why the part where you hold the soldering iron is so far from the tip. It’s like half way up from the tip. Wouldn’t gripping it closer toward the tip give better accuracy? True. I should go ahead and build one as small as my next project. Meanwhile I am pretty satisfied with this one. It make me wonder – would it be possible to use aerogel as an insulator to allow a closer grip? Why does everyone want their fingers so close to the hot parts? I suppose because I’ve been in the repair business for a long time, I’ve found it useful to have an iron that I can stick deep in past other components or case, and not have my hand blocking the view. Yes absolutely. Although in the end I suppose it comes down to a balancing act between giving the tip sufficient thermal mass, having it no longer than necessary, and not burning the user’s fingertips. You can always hold it closer, if don’t mind burger smell. See… THIS is why we need to teach arts students about how to use soldering irons! At least the girls, so they will not damage their soft skins. But at least she’s wearing shooting glasses! Polyester shirt, and a metal ring! What could possibly go wrong. At some point as the iron heats up her hand would jerk and she’d throw the iron into her own face, hence the glasses. She’s a pro with experience. That is awesome. You have to wonder how they managed to get any element of that picture right. Did they get any element of that picture right? 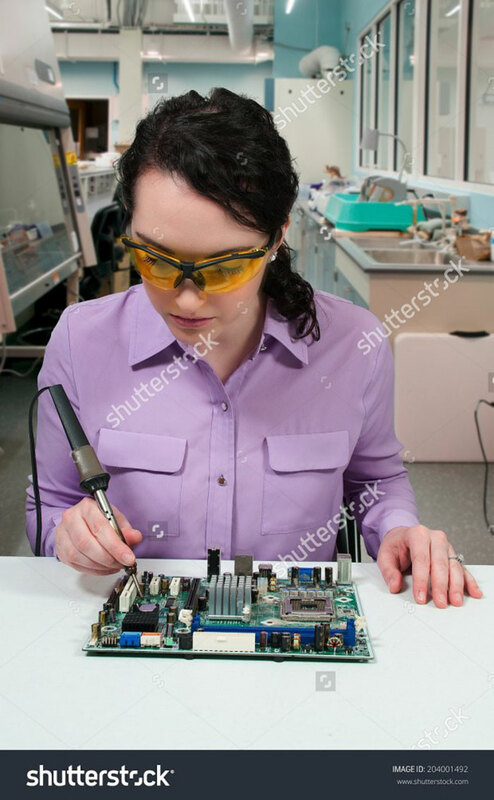 Rofl … gotta solder those cmos batteries!!! Well, someone may have tipped off Shutterstock, they no longer list an image “204001492”. Pace, Metcal, JBC and Hakko all have models with short cartridges. The Hakko T12 doesn’t seem that long, not the part that sticks out of the handle. Not that expensive, either. Lots of aftermarket electronics that you can just plug a Hakko T12 handle into. Personally, I don’t want my fingers that close to what I’m soldering. Gets in the way of my view, and puts my fingers close to the hot stuff. Maybe I just have steady hands. I’ve been soldering since before I was a teen, with some pretty crappy, long soldering irons. They’re worth it though. Got a used JBC lately and it is by far the best soldering iron I’ve ever used. I wonder if a “shroud” (similar to Rifle shrouds) enable you to do that. Probably an internal fan, or a double-layer shroud would keep it from getting hot. Ditch my butane powered one, and get one of these. TBH, I could do with a magnesium alloy shell replacement kit for a TS100 as my TS100 has formed cracks in the plastic. …or even if it has to be made out of some cheaper heavier stuff, then as long as it is intrinsically stronger than plastic. Other than those minor quirks, the TS100 is a very handy portable soldering iron (I’ve ever owned)*! Get one of those little USB lights off of Aliexpress and put it in the other USB slot of your power bank to keep it from switching off. It’s an ugly fix, but it works. I tried this in hopes the uC would keep everything on. But it seems to shut down the 12/16/19V inverter and only powers the USB… also I found the USB goes off if only the inverter is used. It is one of those AUKEY aluminium bricks that I can’t seem to find anywhere online but kept finding at boot sales. I had 5x of these and burnt out 3 (lifted tracks and shorted fets/diodes and two unsalvageably stuck in safety mode Li-ion battery packs), fried the coil of the 4th and the 5th is dedicated to my TS100. They’re rated at 3.2A 19V (4A 12v) and I plugged it into something requiring 4.5A at 19v: I forgot to remove the laptop battery to lower the load, though the bricks happily supplied the current until the magic smoke thickened. I thought I’d seen some aluminum handles, but it seems they are all ABS. Especially if the case is a bit different in shape. Maybe ridges for a better grip,maybe an extended shroud over the base of the tip for people who want to get their fingers closer to the tip. Not sure why anyone would want that, this is already MUCH shorter than every soldering iron I’ve used with the exception of some battery powered and butane powered soldering irons. https://github.com/Ralim/ts100 has worked well for me, at least it allows increasing the sleep time to up to 30 minutes and set the sleep temperature. also your link had a link within the GIT to a video that led to another video… where I’ve just found out the TS100 can short it’s FET on a bad tip… so I’m gonna make a 3.2A current limiter and add a 3A fuse to protect the power-pack from overload and hopefully save the TS100 if I have the same problem occur. Why not just buy a 328p? 6 pin header and ICSP. I thought the same. When he solderd the atmega328, I just scanned the area for ICSP header. Apparently to save the time/effort of putting a bootloader on the bare chip. 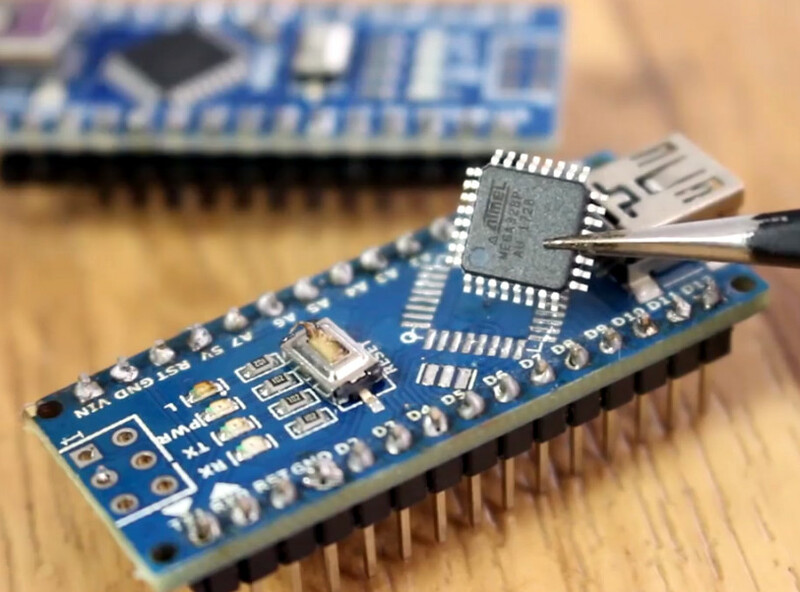 He mentions that buying Arduino Nanos (clones, anyway) costs about as much as bare 328p, so the only thing it costs you is the time to pop it off the Arduino board with the hot air. I would make a variant of this with t12 tip. and a t12 handle with temp control, for field work. small led voltage meter ,couple of aluminum led strip segments and a 5v usb charger circuit with the plug. All bodged-up together, in a self-made soldering station, phone charger, led lamp bundle. It fits in my tool case with ease.